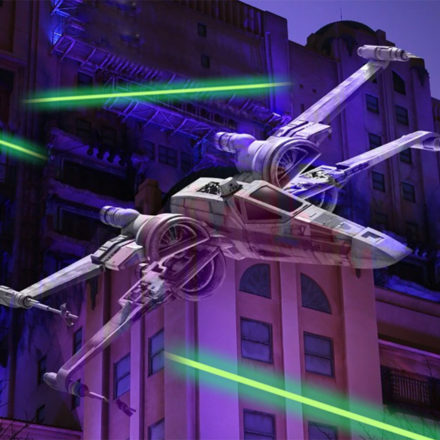 It’s Attack of the Clones in Paris as a familiar attraction seen in Disneyland and Disney’s Hollywood Studios arrives in Disneyland Paris (along with the updated Star Tours and Hyperspace Mountain layover). 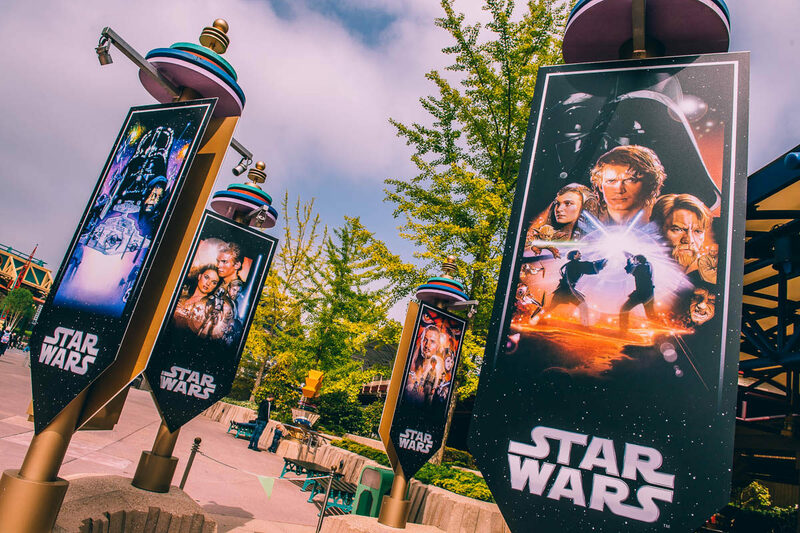 But what may have seen fresh when it debuted with Season of the Force in 2015 at the Stateside Parks, may seem behind the times now. 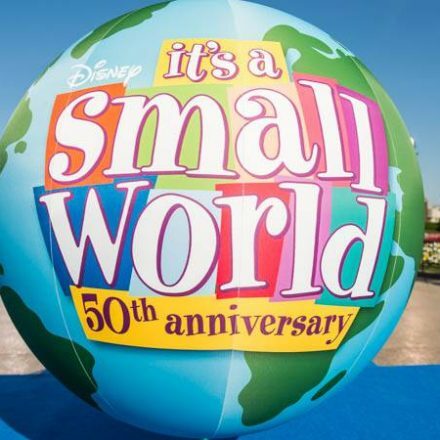 Showing throughout the day at the Discoveryland Theatre, this spot might be the one location in Disneyland Paris that has singlehandedly seen the most different attractions in the 25 year history of the park. Starting with Captain EO, the so called 4D theatre has hosted Honey, I Shrunk the Audience, after going back as the Captain EO Tribute for a few years. 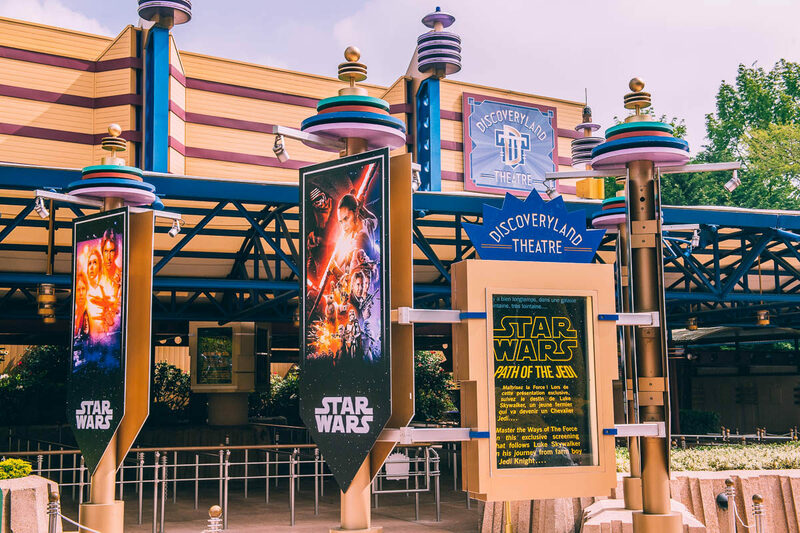 After that closed, it got a very nice rebranding as the Discoveryland Theatre, where it hosted the Ant-Man Preview, followed by the Disney & Pixar Short Film Festival and now finally as Star Wars: Path of the Jedi. Following the footsteps of Luke Skywalker, we are being treated to a montage of the six films Star Wars footage, with a sneak peak of the ‘upcoming’ Star Wars movie: The Force Awakens. But why? Instead of creating an updated version, including Rogue One and a sneak peak at The Last Jedi, we got an identical clone of the American version that opened November 2015, with one major difference: It’s dubbed completely in French, and rather badly as well. As soon as you enter you get shown a behind the scenes video with interviews from Kathleen Kennedy, Gareth Edwards, David Filoni, e.a. As soon as they start speaking, the audio gets muted, and a French voice-over starts talking. This is just the beginning. The main show itself is also completely in French, with all character dialogue being sourced from mixed-down audio, meaning that whenever you hear a character speak, you can hear the sound effects and music from the original movie, on top of the background music that’s already being used in the montage. The quick audio fades make it even more horribly bad, knowing that the French version of Star Wars: A Galactic Celebration does use the clean original dubbing recordings. And there lies the even bigger problem than it being just another outdated copy from an American park. Would it be more enjoyable if it was produced with at least proper dubbing? Perhaps, but even if it were in English, it’s still outdated with two movies already being released since the creating of the original montage, and two more in active production, making it three movies behind that aren’t even mentioned. 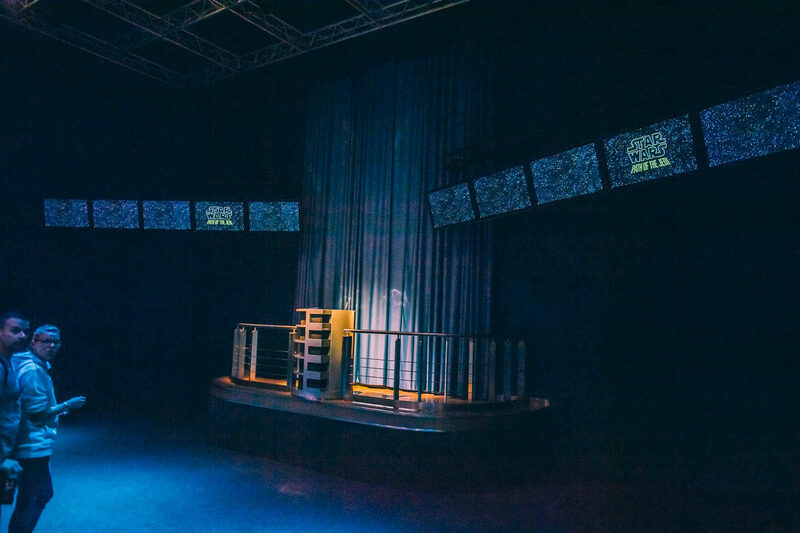 While the high capacity theatre easily takes 700 guests per viewing, it’s really hidden between Star Tours and the freshly rechristened Hyperspace Mountain, making it more of a special discovery than an actual planned destination. It’s just another clip show intended to swallow up as many people possible on crowded days. One of those things that you only do if you done every other exciting thing in the park and want to run away from the weather. In conclusion, can’t we tear down this theatre and make it the entrance to the real Star Wars land the American parks are getting? At least that won’t be dated as quickly. 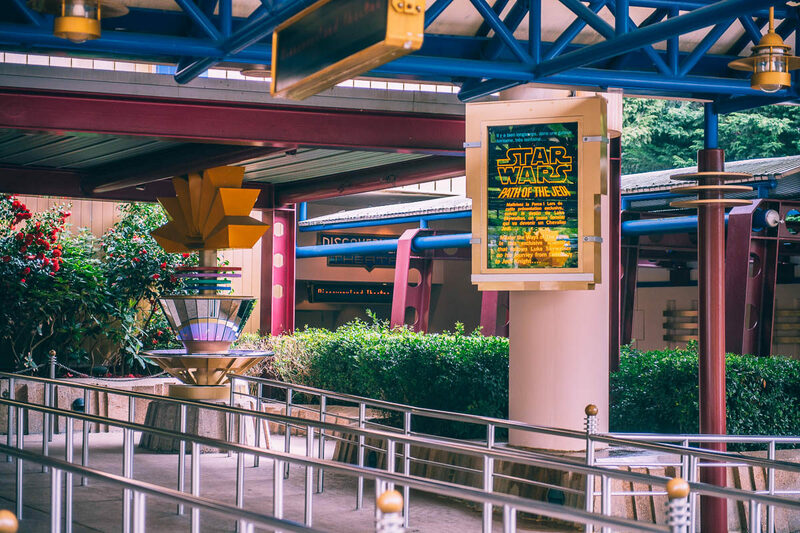 Currently neither of the American Path of the Jedi locations have changed the previews either, which is another problem in itself, when attractions that can be easily changed aren’t. 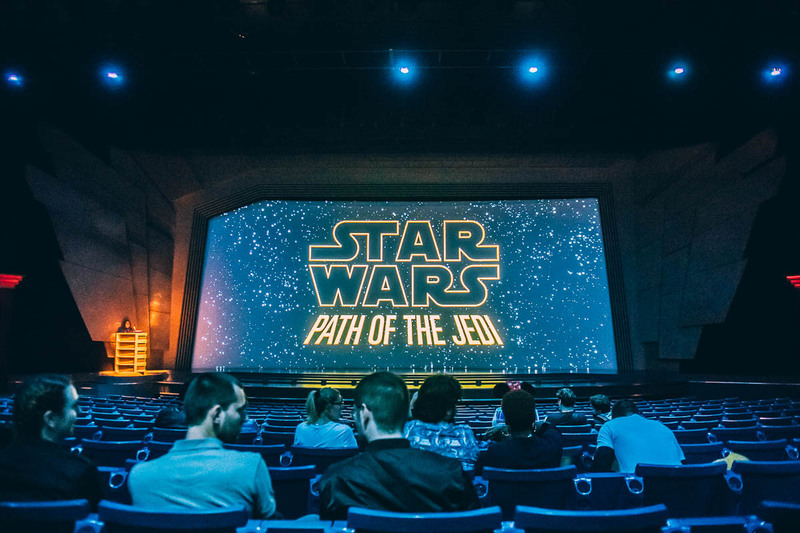 With the Star Wars franchise already wrapped on two new films and with two rapidly approaching, Star Wars: Path of the Jedi should be carrying its own path forwards, rather than remain as ancient as the Jedi Order.